Who says that young online people don’t care about their privacy? If you think that the younger members of social networking sites are too careless in sharing photos of their merry-making with college friends on various social sites, well we are all wrong. According to the report of a study conducted by the University of University of California, Berkeley and the University of Pennsylvania, young adults care as much about their privacy as their older American counterparts. 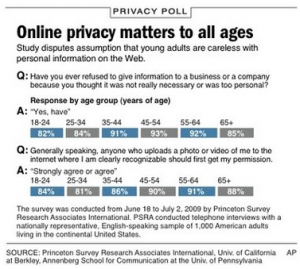 The study is among the first quantitative studies looking at young people’s attitudes toward privacy. And according to Mary Madded, a senior researcher at the Pew Internet and American Life Project, this will surely contradict many assumptions that have been made about young adults and their attitudes toward privacy. The survey was conducted based on a 2009 telephone survey of 1,000 Americans aged 18 and older. It also found out that among those who responded to the survey question, 69% said that a company should be fined more than $2,500 if they violated privacy while 54% said that the fine to be imposed should be higher. Most people — 86 percent — believe that anyone who posts a photo or video of them on the Internet should get their permission first, even if that photo was taken in public. Among young adults 18 to 24, 84 percent agreed — not far from the 90 percent among those 45 to 54. Forty percent of adults ages 18 to 24 believe executives should face jail time if their company uses someone’s personal information illegally — the same as the response among those 35 to 44 years old. This is a very small sampling of people (1000) among millions who use the Internet. 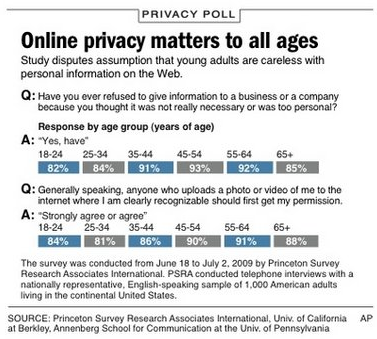 I think it will take a lot more in depth study than this to say young adults care about privacy.